2017 NPR Tiny Desk Contest winner Tank and the Bangas come to Manchester for the first time. 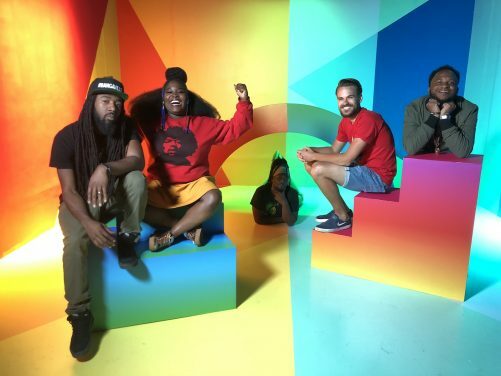 Tank and The Bangas were formed in 2011 at an open mic set in New Orleans, centered at a shot gun house, Jerk Chicken Sam’iches and a drum set. Instantaneously this group knew that they had something that stirred crowds that cried out for original music from them. If you’re from New Orleans, you know all the ingredients to make a good gumbo. Your seasonings have to mix well, your roux has to be thick, and your meat has to be cut to perfection. Tank and The Bangas are what you call a great gumbo! Originating in New Orleans, Tank and The Bangas have all the qualities that relates them, to the city that birth them but a flair that separates them as well. Their performances range from being “One of the most energetic shows you’ll ever see” to “A gospel tent in Mississippi.” Rummaging through their sound like a thrift store hippie, you’ll find the Bangas to provoke a musical reference of Rhythmic Soul and Spoken word among other genres such as Rock, Gospel, Funk, and Folk. Combining the various musical technique among the Bangas, coupled with the instilling play on lyrics from the lead vocalist; Tank and The Bangas have quilted a unique sound that singles them as one of the most distinctive groups to come out of New Orleans.